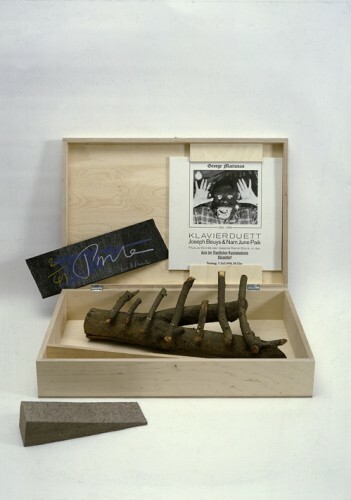 Wooden box with an LP of the George Maciunas memorial concert from July 7th, 1978 at Düsseldorfer Kunstakademie, the "Urklavier" by Nam June Paik and the "Filzkeil" by Joseph Beuys. Numbered and signed by Joseph Beuys, Nam June Paik and René Block. Box: 13,6 x 62 x 41 cm; Filzkeil: 5,7 x 8,8 x 25,2 cm; Urklavier: ca. 40 x 25 x 15 cm.